Katie Taylor and Michaela Walsh are through to the last 16 of the AIBA World Women's Elite Championships after recording wins in Jeju, South Korea. 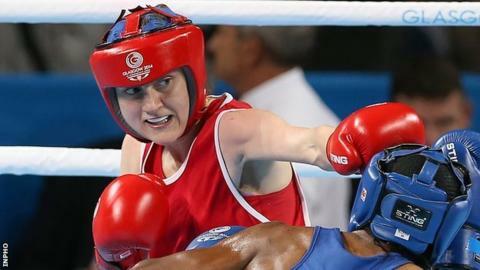 Irish Olympic champion Taylor gained a unanimous points decision over Dominica's Valerian Spicer at 60kg. Belfast bantamweight Walsh beat Sarah Joe Rae of Jamaica on points. Also at 60kg, England's Chantelle Cameron lost to Sofya Ochigava of Russia and Charlene Jones of Wales was beaten by Italy's Romina Marenda. Taylor, from County Wicklow, is aiming for her fifth successive title at the eighth edition of the championships. The 28-year-old worked her way out of clinches with volleys of body shots and found the target with some neat left-right combinations in all four rounds against Spicer. Taylor will meet Mira Potkonen of Finland in her next fight on Thursday. Walsh was awarded a unanimous verdict in a repeat of her clash with the same opponent at the Commonwealth Games in the summer. The Irish fighter claimed a close first round but dominated rounds two, three and four, Rae taking two standing counts in the fourth. Walsh, 21, will now meet Azerbaijan's Anna Alimardanova on Thursday.